Renovated flat in the historical centre of Viareggio, in a peaceful place and no too far from the sea and from the famous "walk on the sea" rich of restaurants, movies, boutiques, pizzeries, coffe bars. Everything was clean and comfortable- very convenient situation. The flat had all amenities. It is close to the beach, the bus station and all amenities. Having an outdoor area to sit was very welcome. Our host Marco was so helpful and even collected us at the airport- I would highly recommend this rental property . We have spent in Viareggio about 10 days in November with really nice air temperatures at about 24 to 26 degrees. Really high advantage of apartment is its location. 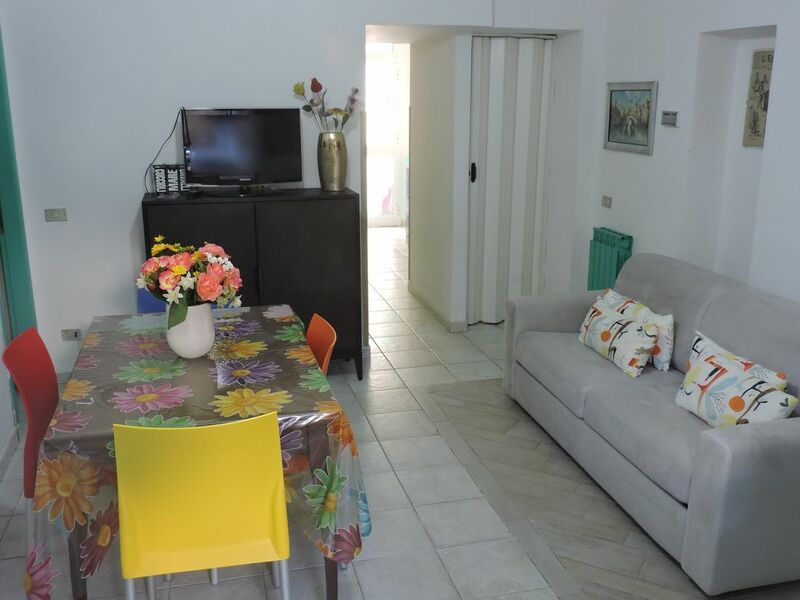 It is near to the railway station, beach and the flat is practically in the center of Viareggio. In the very short distance was the main street, promendate and market. The flat was really very well equipped, both with kitchen items and for example washing machine, umbrellas for rain etc. The next big advantage is terrace where we have eaten dinners in the open air. The owner was very nice and very helpful. He has preprared especially for us brochure with detailed information about places worth visiting in Viareggio as far as in the region of Tuscany (and not only). He also explaned us many details about interesting places to visit. This was very, very nice. The owner from his own initiative propose to take us from airport and back to airport. It was espacially nice particullary after coming to Viareggio (we were a little bit tired). I highly recommend this place for holidays. Marzena (my wife) & Leszek. Casa molto curata e ben tenuta. Bello il giardinetto esterno isolato e discreto con possibilità di lavare fuori sia vestiti grazie al lavatoio che le persone grazie all'acqua calda anche all'esterno. Abbiamo trascorso un piacevole soggiorno in un ambiente tranquillo e vicino al centro. Abbiamo trascorso 20 giorni in questo appartamento famiglia con un bambino e 2 cani . Sicuramente da consigliare e da ripetere ! Ringrazio della gentile recensione, è stato un piacere avervi come ospiti. Viareggio is a famous seaside resort for families, young and old people. The equipped bathing establishments are displaced on 10 Km of beach and along the famous "Walk" there are boutiques, restaurants, movies, pizzeries and a comfortable cycle-path. From the port of Viareggio it's possible to reach the islands of the tuscan archipels and the fabulous "5 Lands" (Liguria). Viareggio is near to the beatifulst tuscan towns: Firenze, Lucca, Pisa, Siena, Volterra and a lot of these towns can be reached with the train. In Torre del Lago (4 Km) there is an open air theatre where the Puccini's operas are performed. The Viareggio Carnival is famous all over the world and Viareggio's cooking of meat and expecially of fish is excellent. The walks on the Alpi Apuane are marvelous. Richiesto supplemento alla tariffa standard per il riscaldamento nel periodo invernale:1,2 euro al metro cubo consumato. Deposito cauzionale, Consegna delle chiavi da parte del Proprietario, Proprietario non presente in loco. Tariffe diverse (scontate) in caso di periodi multipli della settimana. Per periodo diversi dalla settimana da concordare. Nel caso di soggiorni brevi il secondo pagamento deve essere effettuato entro 3gg dal pagamento della caparra tramite bonifico bancario.